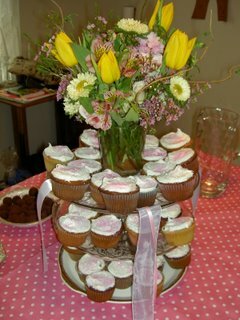 The shower on Sunday was, by all accounts, a big success. The shower ended at 5pm and everyone was gone by 5:10, however, including the guest of honor, so I am not so sure. The delight to the left is my creative effort of the week. I saw an article in the SF Chronicle a few weeks ago and knew it was the perfect thing for the party. 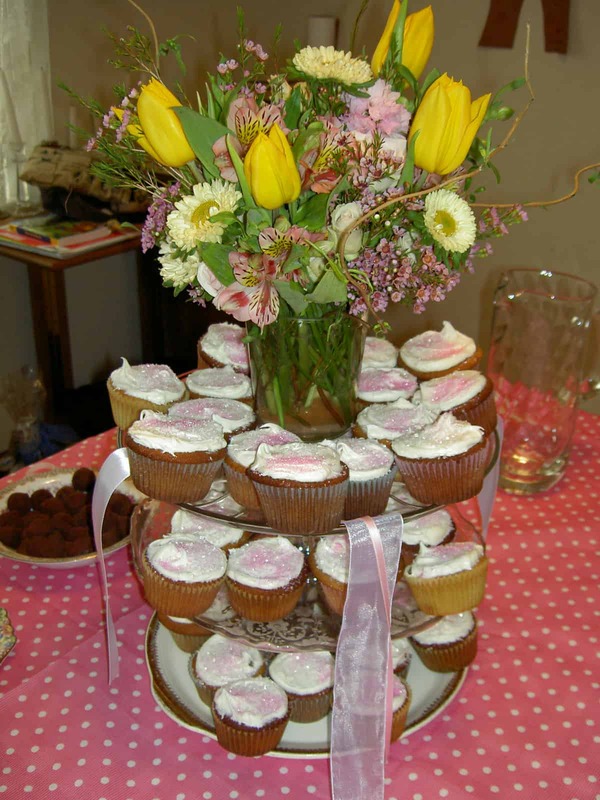 Apparently, cupcake cakes are all the rage these days. I read that people are even using them instead of wedding cakes. The theory is that they inject a dose of fun into the event, are easy to eat and bring people’s senses back to when they were children. Very interesting! The quilt squares were also a big success. More on those when I can post the photos. I am pleased to say that nobody complained about not be able to draw and some lovely squares were produced. 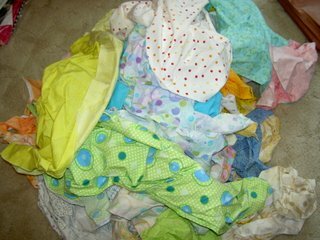 Otherwise, I have been buying, receiving and washing fabric. St. JCN is coming for a visit. Saint, I say, because she offered (I did ask!) to iron about 3 million yards of fabric that I have bought and never washed. Talk about a true friend!!! In preparation for this miracle, I have started to wash it. This was the first load. As you can see, there is plethora of dots and icky green. The dots are for the Thoughts on Dots piece that I have been fiddling with. As you can see I have cut more squares. Some of the fabrics I added are from the washing pile. I did press some of them on my own. This picture is a great example of what I was talking about when I mentioned heavy and light. I have a theory that no fabric is set in stone until the quilt is quilted and the entire quilt has the binding on. I have been known to take apart a back in order to get a piece of fabric out of it. At the moment I am trying out these pieces. I want this piece to look like sherbet… light and fluffy, perhaps a bit foofy; happy. NOT rainy. NOT depressing. The Terri Mangat fabric in the middle is dots, but it might be too heavy. As well, the green dots on the left next to the light aqua Kaffe Fassett design. 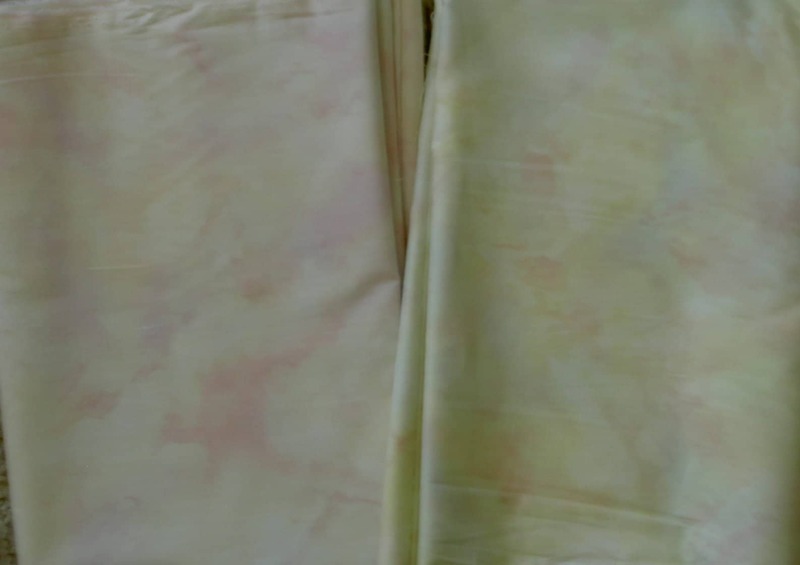 The fabrics with the white backgrounds are also an issue. I don’t want the viewer’s eye drawn to the white. I do love the fabrics, though, so I will play with placement quite a bit before I decide. I have a feeling that whether they stay or go depends on the amount of yellow I put into the piece. We’ll have to see as I cut more fabrics. 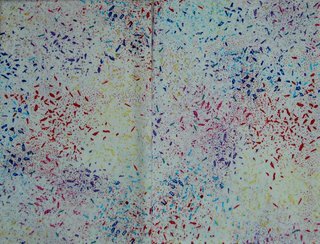 Since, after washing that first load of fabric, I seem to have nearly every dot known to quilters-kind, I have no business buying more. Too bad TDOTNB drove me to shop online. I received the first shipment a few days ago and as you can see: more dots. These are not washed yet, but hopefully will be this weekend. I also got a squares pack of April Cornell’s Poetry Collection. I felt that my other attempt at sewing a whole collection of squares together was very successful. I loved the fabrics in the Poetry Collection, but didn’t feel that I wanted yardage. This was a good solution. I haven’t sewn them together yet, but will do it soon. Who knows? Perhaps another table runner is in my future! It occurred to me that I am getting so many dot fabrics with white backgrounds that I may just have to make one of these 6.5″ squares quilts with all dot fabrics with white backgrounds. It is a thought. I don’t want to bore myself, though. Such a limited project may drive, even me, batty. Go to your studio and make stuff! I was listening to Morning Edition this morning (April 7, 2006) and heard a bit of the last segment with Seu Jorge, a Brazillian musician. He said [paraphrased] that Bob Dylan could write a very simple song that was sophisticated in its simplicity. When I heard this I realized that this is a goal that I strive to achieve in my quiltmaking. This comment coalesced some of my thinking about my quiltmaking. In making blocks to form a quilt design, I strive for a look that is sophisticated in its simplicity. It is not that simple, however, because you have to taking the fabrics, the thread, the quilting all into account. With fabric, and I realized this with the Thoughts on Dots squares, you have to think about the “weight” of the look of the fabric. Does the fabric look or feel heavy or light, sherbety or cake-like? I would love to hear what this means to you. Please make a comment in the comments field or e-mail me via Artquiltmaker.com. In the course of my non-quiltmaking work, I read a newsletter which periodically tempts me to try new technology. Today I tried Keotag. Keotag appears to tell you about references to your search terms (blog, in this case). I found that this blog was linked by the Thumbelina Pear blog. It is a foodie blog (I wonder if s/he posts on wheat-free dishes??). It is a nice looking blog – clean look and fresh colors which appeal to my sense of color and design. I am also quite flattered that a foodie would link to this blog. Check it out! 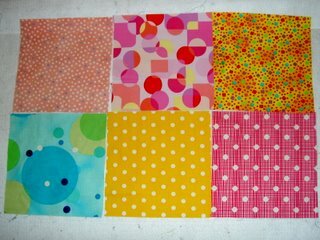 Here are the blocks for SLB’s quilt. There are 38 of them, though I only show 35 here. I will have to make 4 more to make the size even. Then the trick is to get enough people to decorate them! 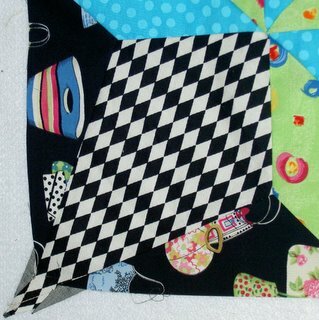 I love that phrase ‘pushing a needle.’ It makes me think about thte quilt work that I do, huh? Anyway, I like to make quilts with different blocks and I think that Judy Martin explains why with her description of scrap quilts above. 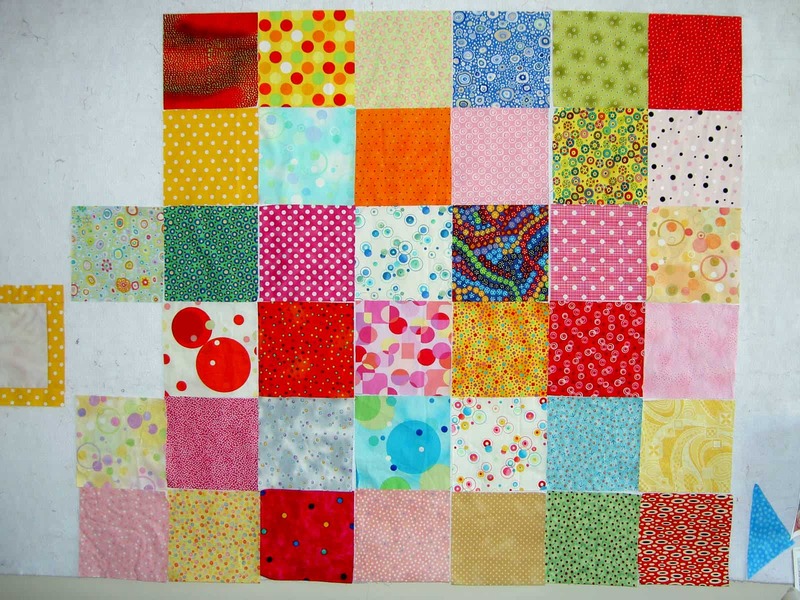 The reason for enjoying scrap quilts is the same for sampler quilts. I think it is worthwhile to read some of the text of quilt books. I am certainly guilty of buying books and then only looking at the pictures. If you read the books, you come up with some gems sometimes. WARNING: If you plan to read this blog entry, you have to be prepared to think outside the box. I plan to play with your mind and disregard most of the ‘accepted’ color rules. I will also have more questions than answers. I have been thinking color as a neutral. The basic question is: can a color be a neutral. Related to this question is another question: can a color act like a neutral? 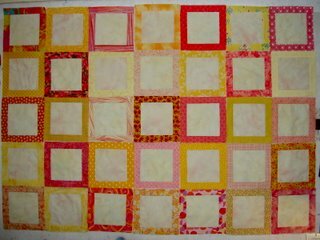 I have made a number of quilts that do not use a neutral as a background or main color. The Punk Rock Quilt uses hot pink/fuschia as the background color. In this case, my test didn’t work so well. I like the quilt, but as far as using fuschia as a neutral, it didn’t work. I think the failure had to do with the proportion of pink to black/white. Additionally, if you use enough of a color, will the ‘rules’ of hot/cold colors force it to not recede or not jump forward? Again, is this a proportion thing? I actually think proportion may be the key. I haven’t had time to further investigate, so stay tuned. Comments are welcome. Author JayePosted on Wednesday, March 29, 2006 Friday, April 8, 2016 Categories 2006Tags Color, ThinkingLeave a comment on Color as a Neutral?? I got a sample of Mrs. Meyer’s dishwashing soap. The scent was geranium. This is not a scent I have ever thought much a about. I don’t think I knew that geraniums had a scent, but I tossed the sample soap into my dishwater last night and it was amazing! Very light, not chemical-ly, not overpowering. I have been thinking about it all day. I was disappointed not to have had more of it tonight when I did the dishes again. Fortunatley, the sell it at drugstore.com, so I can get some with my next order. Aromatherapy in action? I think it has made me happier today…as odd as that sounds. Happiness brings productivity in quiltmaking. All weekend, I worked on SLB’s blocks. My calendar dutifully informed me that I have only 13 days until the shower. Most of the blocks have three sides of sashing sewn on to them. 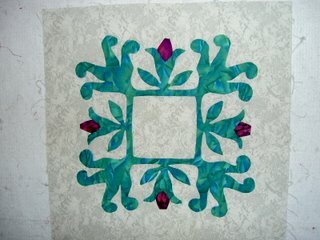 (A good thing) I have been making progress using chain piecing methods and sheer determination. I need to 1) count the blocks; 2) figure out how many blocks I will need to make a nice sized quilt and, finally, 3) figure out if there are people who might like to contribute who will not be at the shower. I think ESGL and MCLB will both like to make a block. We’ll see. Additionally, I cut a couple more blocks for the Thoughts on Dots piece. Immerhin. The addition of the blue dot square (Alexander Henry??) looks good. I think pink and yellow make an excellent combination, but want to use more of my dots than just pink and yellow. I have a chocolate brown with dots that I will have to dig out, as well. I think ToD may be the one use I will find for it. 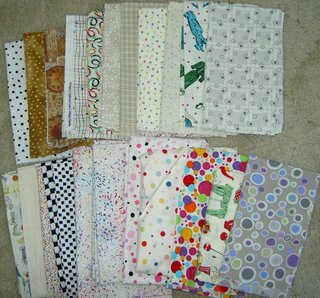 All of this block making (SLB’s and the ToD) is sort of related to the Judy Martin’s Scraps book. I started reading it last night and she has an interesting essay on scrap quilts. 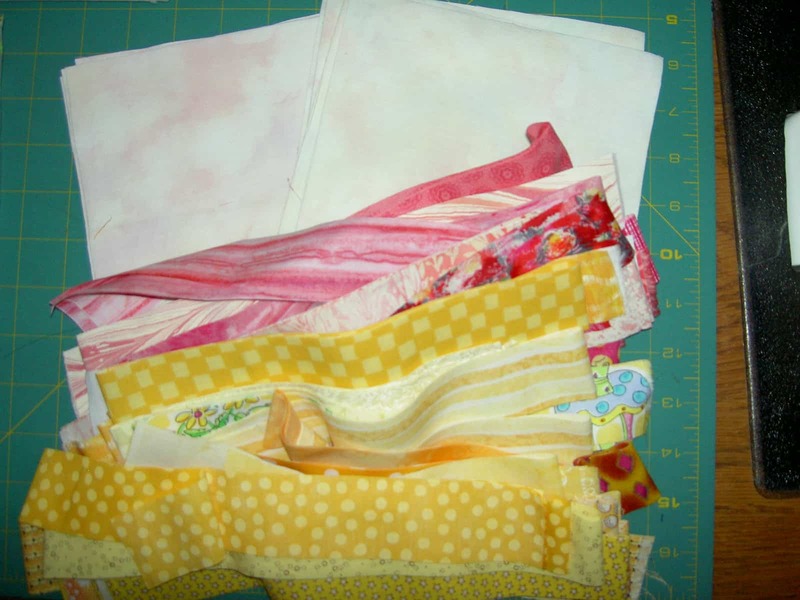 One of the things she says (paraphrased) is that if you use the same fabrics for all of your blocks, the creativity ends after the selection of fabrics, but if you use scraps, each block is a new work of art. I like that thought and I think it is true. SLB’s blocks all have different sashing, which make them somewhat scrappy. It will definitely look scrappy once it is put together. It makes me much happier working on SLB’s blocks to have so many different fabrics to work with. How can I resist Judy Martin? Her stuff is great! Scraps is Judy’s latest book and I think this is the answer to my comment in a recent post about Knockout Blocks and Sampler Quilts, Martin’s previous book. Scraps is a project book. Many of the blocks used in the quilts seem to come from Knockout Blocks and Sampler Quilts, especially noticable in Cooperstown Stars. She has patterns for every skill level and the directions seem to be clear and well illustrated. Though I dislike sections on “how to make a quilt”, Judy’s is very well done and I often read this section in her various books, because I always seem to learn something. Three-of-a-Kind is similar to a free Block of the Moment on Judy’s website called Celtic Squares. She has great BOMs and I keep them all for future when I have skads of spare time. I did get some sewing and fabric work done over the weekend. Nothing fantastic, but it felt good just to be handling fabric. I actually finished this block on the way back from our ski trip the first weekend in March. I didn’t get around to pressing it until this past weekend. 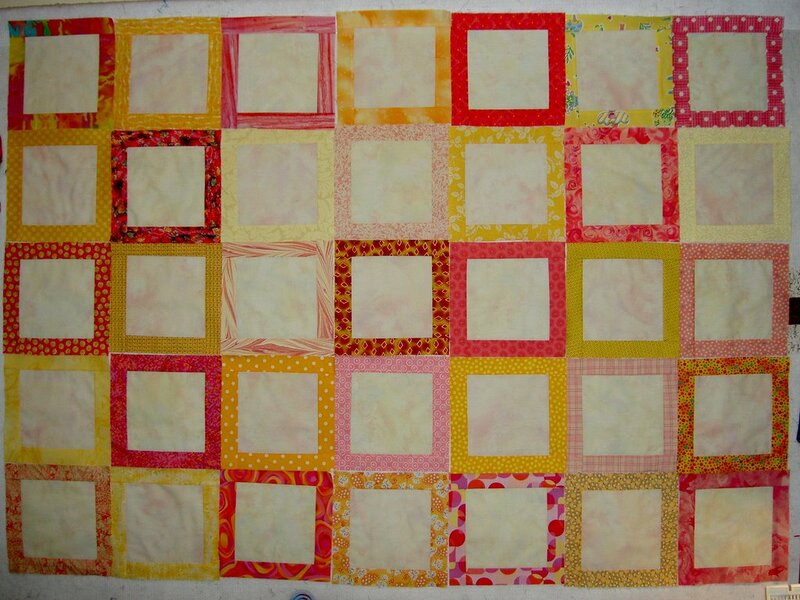 I started this block years ago in an Elly Sienkiewicz class when I thought I might want to do a Baltimore Album Quilt. Two blocks taught me my lesson. All of you who do needle turn applique’ are goddesses. I will never be one. This block will go into the orphan block quilt that I plan to make when I am old. I just stopped receiving the 4×4″ squares from Benartex. I decided not to renew my membership in the club as receiving the 4×4″s was starting to get on my nerves. 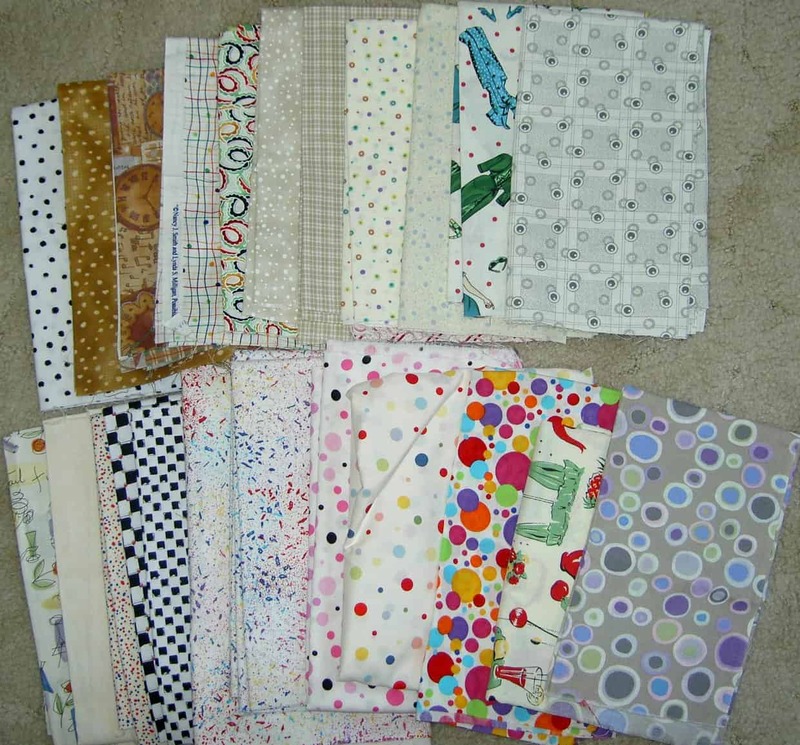 I no longer wanted to find a place to stash them and have given up on making a 4×4″ square quilt. However, this group came and was on my sewing table on Friday when all of sudden I became desperate to sew. I just sat down and sewed them all together. They are definitely in the color scheme of Robyn Pandolph, a color scheme that I admire. I always think I might make something in this color scheme, but then always end up adding hot pink or lime green, which isn’t this scheme at all. This was a good way to get it out of my system with very little effort on my part. Now I have a big rectangle of squares on my design wall and am not sure what to do next. I could do nothing and just admire what I have when I am in a Robyn Pandolph sort of mood. I could make a table runner. I could make this the center medallion of a quilt. I am not sure yet. Still, it was fun and fun is definitely a good thing. I also finished my block for the Sampler class. The technique was foundation piecing and the block is a simple New York Beauty. I am not happy with it at all. It is too simple. 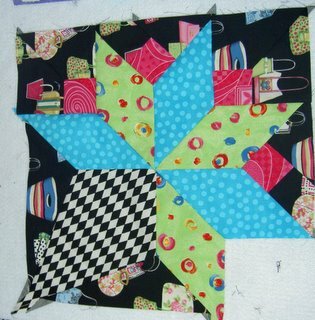 This block made me think that I could just keep these blocks as class samples and not make them into a quilt. This presumes that I will teach a sampler class again. There is something about the blocks together that makes me not want to make them into a quilt. I will have to figure out what. I also made progress on SLB’s wedding shower quilt. I cut all the blocks and all of the strips that we picked out. I plan to start sewing the strips this weekend. 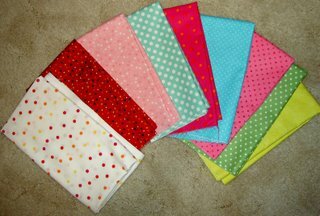 RE: More Thoughts on Dots — I also began cutting 6.5″ squares of dot fabrics with the thought of making a simple yet happy quilt with all of the dot fabrics that I have. So far I have four blocks. Immerhin. At the drugstore, I happened upon BH&G’s Spring 2006 issue of Quilts and More. I had never seen this magazine before and was immediately drawn to the quilt on the cover. There should be no suprise that this quilt was made with dot fabrics. The block is called, according to the magazine, at least, Dolly Madison Star. I haven’t looked it up in resources I consider to be more reliable, so I can’t say at the moment. I tried to find a picture of the quilt on the web, but the BH&G people don’t have it on their website so you’ll have to trust me that it is a seriously cool quilt. Excellent use of many dot fabrics. I would actually consider making a quilt similar to this, because it is the perfect quilt for a grey, wet and cold winter in a life-sucking beige house. Dots are definitely on the mind, but so are some new books that I have bought or received as gifts. In general I don’t like books that are mostly patterns. I like books with lots of great pictures that depict quilts that show me something new and inspire me to think outside of the box. The Modern Quilt is a pattern book, but the designs are innovative and fun. They are supplemented by smaller pictures showing different colorways. There are bits about putting together colors. The best part is that the authors (and publishers, I suppose) had the guts to include patterns with curves and other odd shaped pieces. This tells me that they are not condescending to the lowest common quilting denominator. YAY!!! Some of the piecing reminds me of Ruth McDowell’s Piecing book. 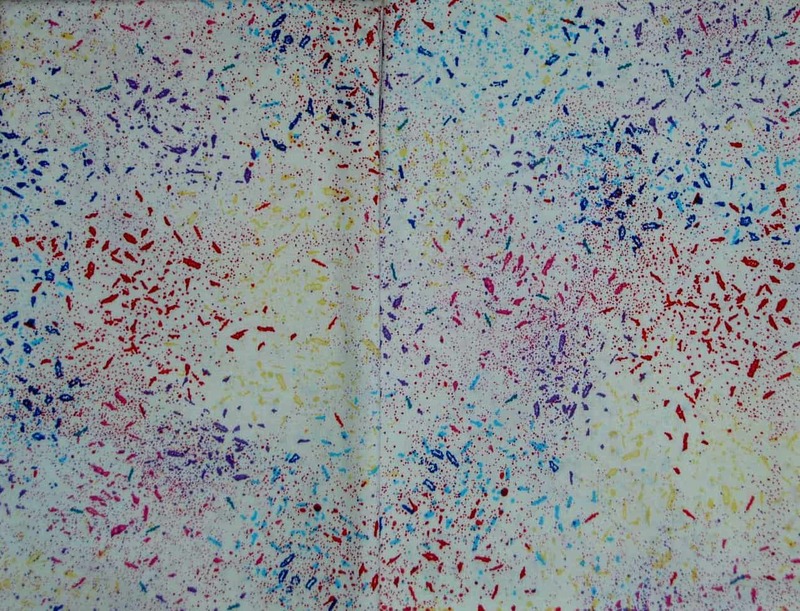 Ruth McDowell’s Fabric Journey is another recent acquisition. She is, without a doubt, my favorite quiltmaker. Jane Sassaman and Judy Martin run a close second, but I love Ms. McDowell’s nearly exclusive use of piecing and her nearly exclusive use of commercial fabrics. She really teaches, and demonstrates in her quilts, the extraordinary things that a quiltmaker can do with piecing and celebrates good technique. Fabric Journey gives insight into several of Ms. McDowell’s quilts. Ms. McDowell discusses several of her quilts, the inspiration, the use of fabric and various piecing techniques. This is not a pattern quilt per se, but the reader can use the descriptions to create their own designs. Again, Ms. McDowll does not condescend to the reader. She gives the impression of assuming that, with practice, anyone can piece the way she does. 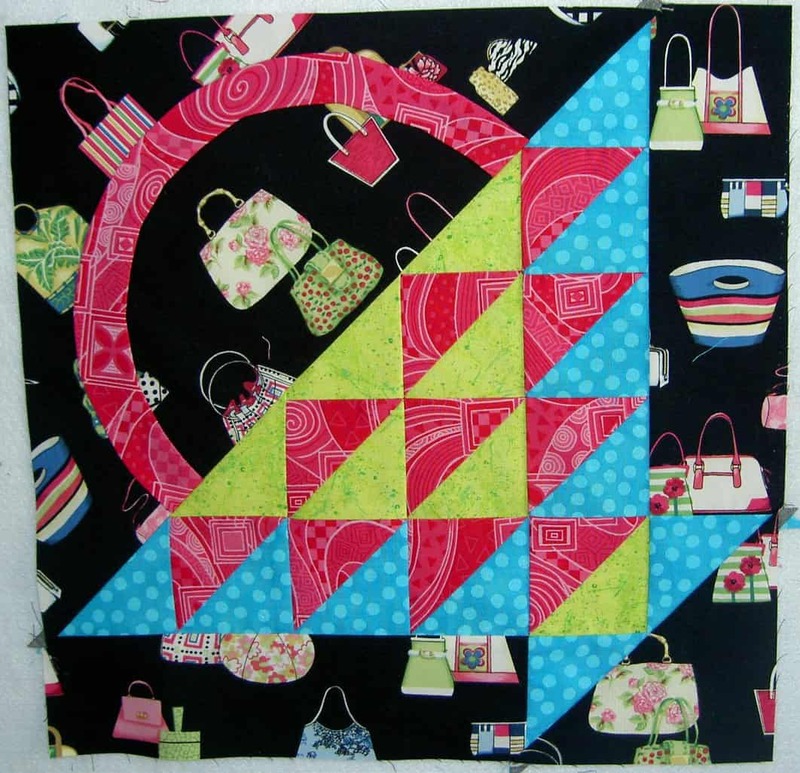 Whimsical Quilts by Carol Burniston was a total impulse buy at Thimble Creek. The reason I bought it was because it had a great and fun pattern for appliqued flamingos. You never know when you might need a pattern for flamingos, right? It is a pattern book, but it does have fun colors and lots of good photos. The other quilt I like in the book is called, oddly enough, Hot Tamale Sunflowers. There is also a fun sheep quilt that I would never make, but it is cute. The books also includes a fish qult with a lot of possibilities. The book makes me smile, so it was worth the price. With my birthday money from RBL, I bought Mary Schafer American Quilt Maker by Gwen Marston. I have a number of Marston’s books and really enjoyed the workshop on Libertated Quiltmaking I took from her a few years ago. The quilt I made as a result of the techniques I learned in the class can be seen on Artquiltmaker.com. The Mary Schafer book has nothing to do with Liberated Quiltmaking, however. It is a history type quilt book depicting the work and collections of Mary Schafer. The quilts are classic in style, though many of them have a twist, such as Grandmother’s Pride, 1980, pg. 111. I also like the pictures of Schafer’s templates, patterns, family photos as well as the numerous color photos of quilts scattered throughout the book. For my birthday, JZS was kind enough to buy me Textile Designs from Thames and Hudson, which has been on my Amazon list for an eternity. This is a book that shows the history of textlie designs for the past 200 years. It is great to look at the variety of patterns through 200 years. I particularly like some of the futuristic patterns, such as those in the Geometric section on page 199 and those on page 185 and 186. It occured to me that, if I found the perfect pattern on one of the pages, I could scan and print it to fabric for personal use only, of course. Fabric designers should look at some of the 20th century designs in this book recolor and reprint them. Pattern designers seem to focus on the Civil War type colors and patterns at the moment and those are just too boring (in design) and too depressing (in colorways) for me. 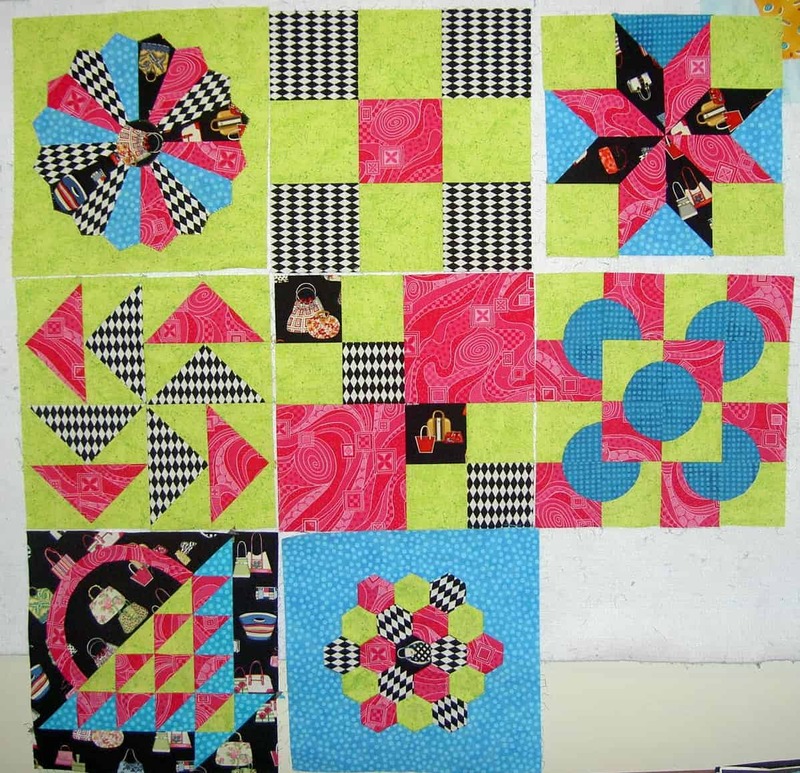 Index to the Laura Wheeler Quilt Blocks is one of a series of indexes that Rose Alboum from West Halifax, Vermont is putting together. This index is one of the ‘block dictionary’ type books that I love. It has the name, number and a sketch of all the blocks designed by Laura Wheeler. There are no templates or patterns, but the blocks could easily be designed in EQ5 or by some other pattern design method (e.g. normal drafting). Perhaps Ms. Alboum will cut a deal with The Electric Company and EQ will issue ancilliary CDs with these patterns on them! Again, it is great to see the old patterns because they have odd shaped pattern pieces. I look forward to seeing more of Ms. Alboum’s work. Another impulse book buy, while I was in Seattle in January, was Paper Piecing Picnic by the editors and contributors of the QNM and Quiltmaker magazine. Again this is a pattern book, but there are some nice photos, especially of Indian Wedding Ring, page 72, Dandelion, page 67, Trip to New York, page 63, and Fireworks, page 43. I also like the row quilt layout of Sunflowers, page 52, but am not so excited about the square-ness of the actual sunflowers. Also the mathematical relationship of the center to the petals seems a bit off to me, but it could be the photo in the book. The photos in this book are clear and there are many of them. The instructions, if you like paper piecing seem to be easy to understand. I also like the bright colors. B&B sent me Kaffe Fassett’s Museum Quilts, also for my birthday (what a bonanza this year! WooHoo!!!). For Fassett, it is all about the fabric and I love the many fabrics that he uses and the combinations that he comes up with. The designs/patterns have the feeling of classic quilts, but the fabrics and details make them fresh and new. I also love it that he is not afraid to mix color and pattern. There is always more fabric, so why be concerned that patterns might clash? I like the way a number of the quilts reflect mosaic floors. Unfortunately, the publisher seems to have required the ubiquitous “how to make a quilt” section. I don’t know why publishers just don’t refer to some other more complete book on quiltmaking rather than forcing authors to waste 30-50 perfectly good pages on an inadequate section on how to make a quilt. Not that the directions in this book are poor, but making an entire quilt, no matter how good the directions, cannot, IMO, be explained in 30-50 pages. The space would have been better used for a few more quilts or a gallery section. I admire Sally Collins precision work a lot and her latest book is another that I purchased with birthday money. It is called Borders, Bindings & Edges. First, there are excellent pictures of Collins’ quilts, but include other artist’s work as well. This is a book about techniques. Collins believes that precision piecing is important and this book thoroughly explains how create different types of borders, including mitered corners. She also discusses bindings (thus the title) and has lengthy discussions on different types of finishing. If you want to improve your technique, I would recommend this book, as well as one of previous books, The Art of Machine Piecing: How to Achieve Quality Workmanship Through a Colorful Journey and Small-Scale Quiltmaking: Precision, Proportion, and Detail. Quilt Visions 2004 is a catalog of the Visions show, held in San Diego every other year. This is my perfect book, in many ways: no patterns! I like Cacti I by Nancy Cordry, Autumn Splendor by Nelda Warkentin and Weavings 12 by Marie Castle Wing, but am annoyed by the ‘quilts’ that look like photographs. I could discuss the “is it a real quilt” issue with people for years, but the bottom line for me is that if there is no piecing or applique, then it is tending to not be a real quilt. This, of course, begs the question of wholecloth quilts, but perhaps they are not quilts either? For photographic reproduction ‘quilts’, I just don’t see the point. Take a photo and move on, IMO. This book comes with a CD, which I haven’t had the chance to review yet. I like the trend towards including CDs with books and guilds creating CDs of their shows (go to Content Innnovations, LLC’s Website to buy a couple of CDs from local Northern California shows). It makes the shows less ephemoral to me. Aja gave me Art Quilts: A Celebration for Christmas. Again, this book has no patterns or project sheets. It is a catalog of 400 art quilts from 1995-2003 arranged by year. I love it! First, I am happy that they are not telling me how to make these quilts. Second, I love the organization. Someone (a librarian, maybe??) got the publisher to organize the quilts in a way that makes sense. This organization makes it easy to see how art quilts have evolved. 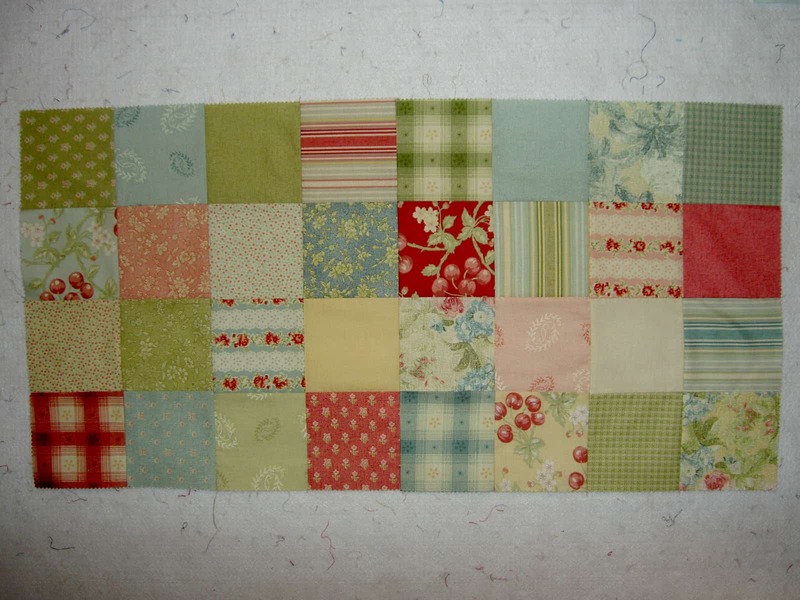 Third, I like the selection of quilts chosen. I can appreciate the wide variety of techniques, including photograph type quilts, when there are a wide variety of techniques shown and you can see the photos in context. I hope the publisher does well enough with this edition to do future updates of this book. Buy Art Quilts: A Celebration to show support! Karen K. Stone’s book Quilts was one I bought when I bought the companion software from the Electric Quilt Company last year. It is a pattern book, but there are a few photos that show her inspiration and the close-ups of the blocks are so good that it makes the pattern part worth it. 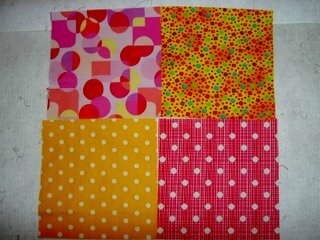 Her fabric combinations remind me of Kaffe Fassett’s. Judy Martin is one of my favroite block designers. She is prolific, supports herself with her own business and doesn’t condescend to her readers. Sense a trend here? The blocks she designs are classic with a twist. She also seems to want people to try out odd shapes and teaches how to create them. 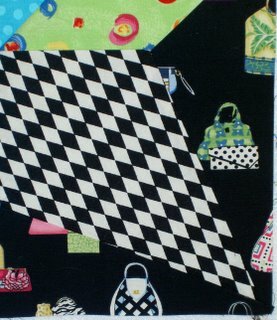 Her book, Knockout Blocks and Sampler Quilts has an amazing number of new block designs and quilt layouts to try. It is, however, a bit of a disappointment. Note: definitely still worth purchasing! The designs are great, extremely creative and fresh, but there are no actual fabric quilts shown in the book. It looks like all the quilts pictured are computer generated. I can appreciate the speed with which one can create computer generated designs and, thus, produce a book, but I want to see actual fabric quilts made with the patterns. I would love to see an update of this book, or a companion book with actual fabric quilts shown. I bet Judy could find fans to create blocks and quilts that could be used in the updated version of the book, if she doesn’t have time to do all the sewing. I’ll sign up for a block or two! If you like blocks, this book is still a wonderful resource. Cookies and Quilts is also a Judy Martin book which combines quilt patterns with decadent chocolate recipes. This book has lots of photos of quilts. Not all of them are star quilts. It is primiarly a pattern book and there are no sections with blocks only. I haven’t tried any of the cookie recipes, but the photos of the cookies look delicious. I had a lot of driving to do today and had a thought on dots as I headed out. 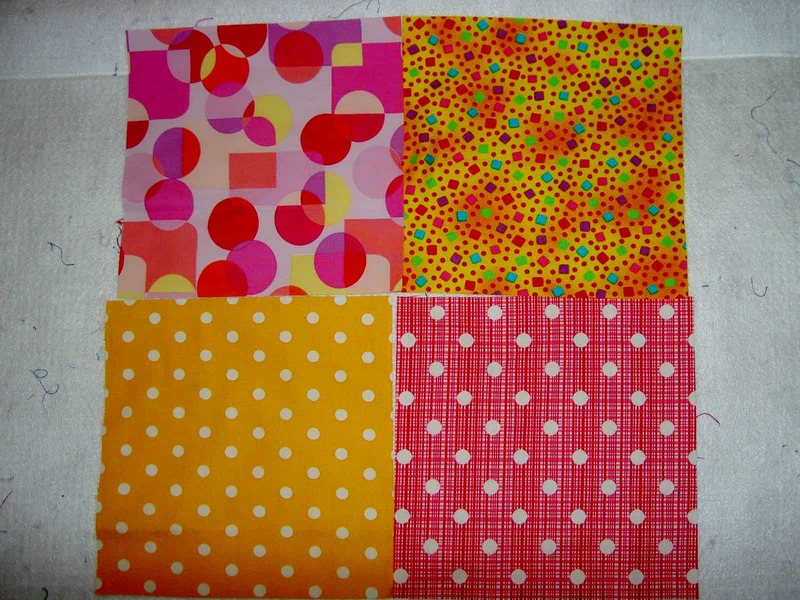 I have been collecting a lot of dot fabrics lately with the thought of doing another Interlocking Triangles quilt. I definitely want to work on that project, but I have enough dots to choke a herd of horses, so I could do a number of projects with them. 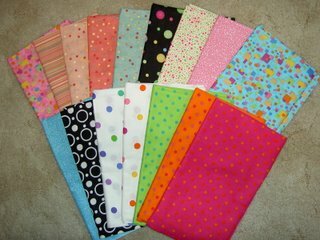 The ones I bought recently, especially the pink (3rd from the left), made me think of cutting 6.5″ squares (6″ + seam allowance) out of a bunch of different dot fabrics and sewing them together. It would be another quick project, but it might be really nice to see those dots out in the open. After work yesterday, I stopped by Thimble Creek since I happened to be in the neighborhood. I always liked that store. I remember it being very different from New Pieces and Cotton Patch when it opened. I liked the high ceilings and the energy. They also often had really nice quilts hanging up. The energy has changed there. The people seem much more businesslike and not as friendly- not unfriendly, just not as friendly. Perhaps they were just being businesslike. I certainly have no objection to running a business as a business. Perhaps I was giving off “don’t bother me” energy. The store is smaller since the last time I was there (2 years ago!). They gave up the part that had housed the gallery and solids area as well as books. The cashier said that they still had the same amount of fabric, which I could believe. The store seemed a little more crowded and not as open and airy as in the past. I had hoped that the icky green would match the fabric from the Sampler, but I don’t think it will. It is a bit too yellow. I think I will have to give up and use a substitute for the icky green in the Sampler. 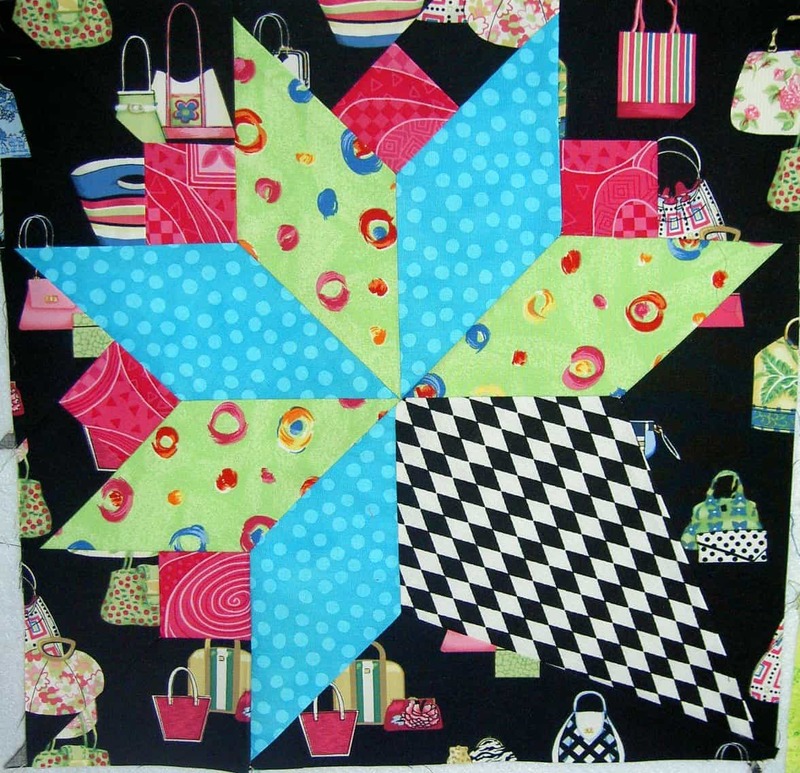 I am thinking that the next Interlocking Triangles quilt will have the background shown in the previous post with the Jennifer Sampou spirals and dot fabric. Now just to complete the pattern and get started. I was also inspired by some of the quilts they had hanging up. Some I liked the patterns and others I liked the color combinations. I didn’t take photos as they stopped allowing that the last time I asked. I didn’t,however, ask this time. 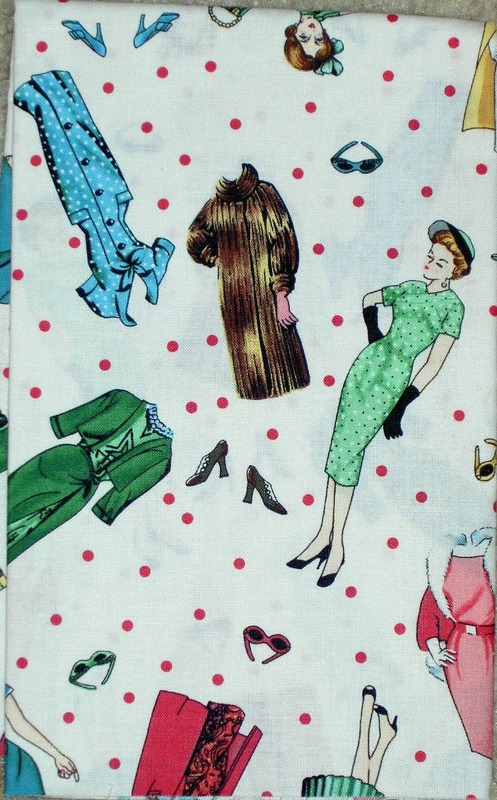 It seemed like a lot of the patterns or color combinations I liked were by a pattern company called Uptown Girl. I couldn’t find anything about them on the web, so if you know their website, send it along. I drew a picture of one in my journal and will see about posting it. I know it is difficult to see the subtle shades of pink and yellow, but it will be a nice background on which people can draw. This fabric will be perfect for another in the Women’s Work series. I have been updating Artquiltmaker.com and reading over some of the statements has helped in my creative process, I think. Now I just need time and energy! Is it Possible to Have too Much Icky Green? 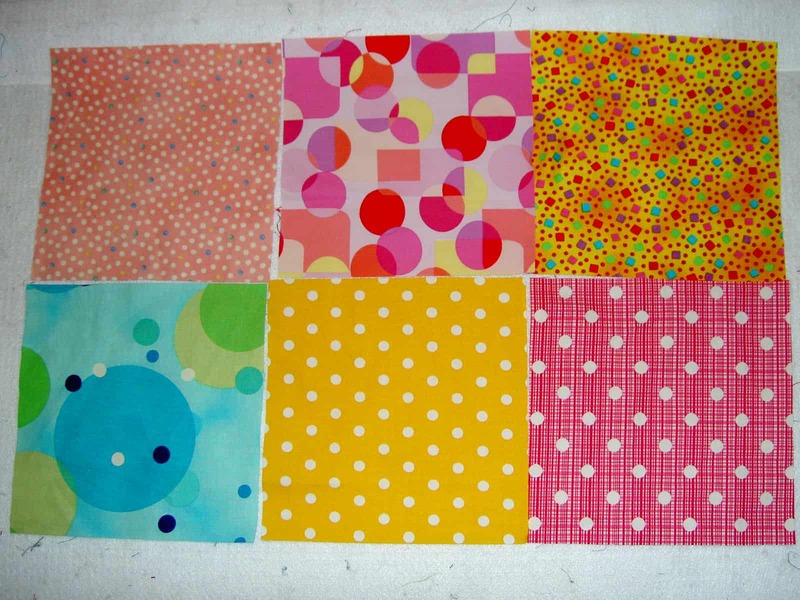 These are the blocks that I have made so far as examples for my beginning quilt class. I usually keep most of them at the office for teaching purposes, so this was the first time I had put them all up together on the design wall. The first thing I noticed was that there was too much of that acid/icky green. 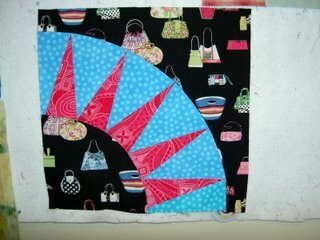 Not that you can really have to much of it, but I need to use more of the purse conversational with the black background in the future blocks (still have a fusible applique’, a foundation pieced block and some others to complete) and well as the tone-on-tone blue dot. This is definitely a good example of why you should look at your quilt blocks before you finish them and put them together. I am not Paula Nadelstern who works on a tiny table and never looks at the whole quilt while it is in process. She is a genius and I strive to be like her. EQ5 directly. Always one to revert to pencil and paper, I drew out the block with pencil and paper and made the templates on graph paper. It went together fine until I got to the cone part of the block. The two background pieces were obviously too small. I checked the template with the fabric and they matched. I couldn’t figure out the problem, then work got busy and we went skiing. Finally, this week I was forced to prepare some more templates for class and took drastic action by deleting the pathetic HP Mobile Printing. Now everything works fine. I can’t print directly, but I can save to PDF, which HP Mobile Printing was preventing from EQ5. I redid the templates for the Nosegay and sure enough all of the original templates were fine, except for those two tricky background pieces. I also finished the basket. I like the way it turned out and was pleasantly surprised when I used the purse conversational with the black background as a background. Author JayePosted on Saturday, February 25, 2006 Sunday, October 14, 2018 Categories 2006Tags SamplerLeave a comment on Is it Possible to Have too Much Icky Green? 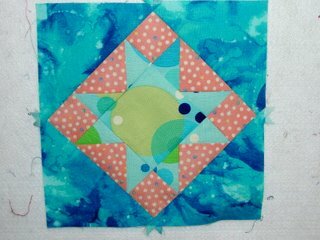 My students are back in the groove of quilting, so tomorrow I will give them their next block, a foundation piecing block. I picked the New York Beauty for the block with the Pineapple as the alternate. Not sure which one I will do. Perhaps both. I still have to finish the damn Nosegay and am thinking that I will have to completely redo the bottom (cone) part. It just doesn’t fit. C’est la vie. I did have osme success with applique’, however. The Grandmother’s Flower Garden petals are applique’d to their background. This is one of the blocks from the class that has been kind of languishing. I also worked on applique’ from an Elly Sienkiewicz class that I took years ago at Thimble Creek. It is one of the blocks from one of her Baltimore Album Quilt books. After doing two of the cut snowflake type blocks I decided that there was no way I could do an entire Baltimore Album Quilt. Still the block I worked on is nice and I did want to finish it. My applique’ leaves a lot to be desired, but it shows me making progress. The journey not the destination. I look forward to finishing it so I can say that one UFO is off the pile.